Dimensions 57" x 29" x 34"
The Garlando Master Champion is ITSF table authorized for competitions International, Master Series and Pro Tour. This freeplay version of the World Champion sums up the same excellent features as the coin operated model in a home product and is the official ITSF model for the international competitions of the category International, Master Series and Pro Tour. Used by the professional players in tournaments worldwide, it boasts competition score counters and leg levelers, rubbers on the bars and a distancer to keep the goalkeeper within the goal range. 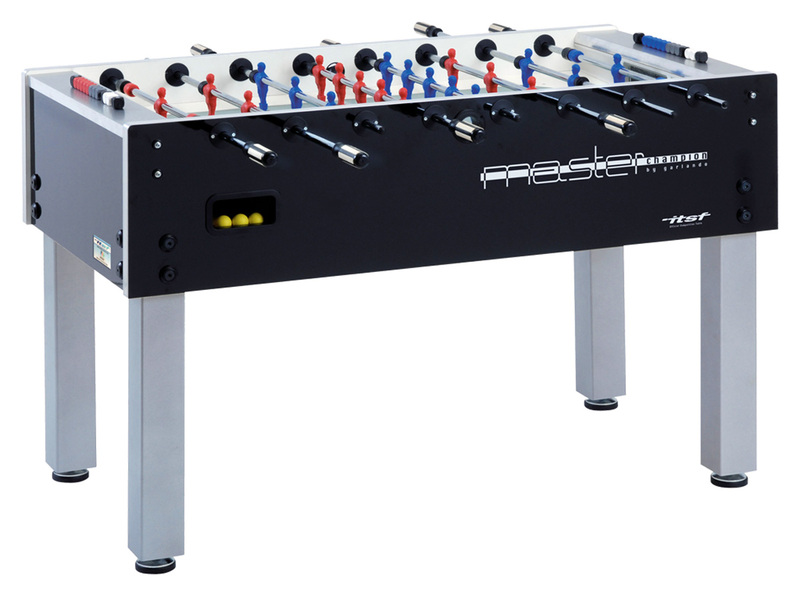 A freeplay model and, at the same time, a real competition table. The Master Champion is a deeply innovating product compared to the traditional home table and it is the ideal tool to train before the international tournaments. The cabinet constructed from high quality 1-1/4” thick multi-layer plywood coated with plastic laminate and aluminum border. The table has the ITSF logo and official Competition plate with series number. Solid 4-inch square steel legs are coated with anti-scratch silver powder coated varnish. Competition levelers for a perfectly flat playing field. Machine-true 16mm diameter hollow steel bars with increased thickness (3mm instead of 2.2mm, allowing 50 % more torsion resistance). Bars are treated with anti-rust chromium plating. New 21mm rubber bumpers instead of springs for a better shock absorption. Distancing rubber on the goalkeeper bar maintaining the player within the goal range. Steel roller bearings to greatly improve the game speed, while reducing the stress for the players' wrists. One-color players in plastic material (moplen) representing a stylized human figure, directly molded onto the bars: they do not move, cannot be displaced and maintain their positions perfectly. Team colors: red and blue. Professional plastic handles with wooden inserts to reduce perspiration and improve grip. Playing field of non-reflective sanded 5mm thick tempered glass with silk-screen printed white lines on a green background. New playfield corners without steps for a correct ball running. Goals in HDP (high density polymer) reinforced with fibreglass and innovating profile molded to prevent irregular ball trajectories. Balancing inside goal to absorb the ball bumps and preventing bouncing off. Balls served through a filler on each table side. Easy and quick ball recovery through a ball pocket on each cabinet side. Competition abacus score counters enabling to mark game sets and goals. Includes 3 high control balls. Play on the table that the Pros play on! Dimensions: 57" x 29" x 34"